Always wanted to learn DTML, but didn't know where to start? Today's your lucky day. One of the nicest things about Zope is its ability to separate an application's presentation layer from the business logic that drives it. It does this using its very own tag-based markup language, Document Template Markup Language or DTML. What's DTML? Well, as the Zope Documentation Project at http://www.zope.org/Documentation/Guides/DTML-HTML/DTML.3.html puts it, it is "...a facility for generating textual information using a template document and application information stored in Zope. It is used in Zope primarily to generate Hypertext Markup Language (HTML) files, but it can also be used to create other types of textual information." Or, to put it in words you and I understand, DTML is HTML on steroids. I don't say this lightly. After all, HTML is fairly popular by itself - it's the language used to mark up every Web page on the planet, and required study for any Web developer. But DTML is much more than plain-vanilla HTML - it's a proper programming language which comes with variables, loops and decision making constructs, together with string and math functions borrowed from Python. It's also fairly easy to use - as you'll see over the next few pages. Before I begin, though, make sure that you have a working copy of Zope (this tutorial uses Zope 2.5.0), and can log into the Zope management interface. In case you can't, drop by http://www.zope.org/, get yourself set up and come back when you're ready to roll. This is the tool that you will be using to build your Web applications. You can use it to create documents, folders, and your own Zope products. And the first step in this process is to create a folder to store all the methods and objects that I'm going to be constructing. and give it the ID "DTML Basics". You don't need to create a public interface at this time. 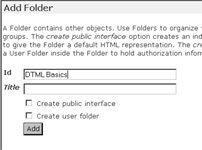 The next step is to navigate to the folder that you just created and add a DTML Document object to it, using the process outlined above. 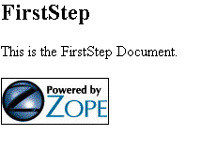 Give this document an ID of "FirstStep". As you may have guessed by now, the object ID that you assign at each stage is fairly important - it provides a unique identifier for the object within Zope, and can be used to access and manipulate it from your DTML code. Once you've assigned the document an ID and saved your changes, you will be returned to the main folder listing. Your newly-minted object should now show up in this listing. Right. Now, how about editing it? 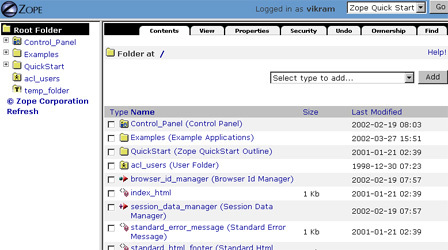 Click the "Edit" menu function (look at the tabs at the top of your screen) and Zope will show you a form containing the current contents of the FirstStep object instance. and take a look at the output of all that code. Let's take a closer look at the DTML code which generated the screen on the previous page. This is the <dtml-var id> Document. As you can see, this code block contains both HTML and DTML. When Zope processes this DTML Document instance, the DTML tags within it will be processed, and will be replaced with the resulting output. If you're familiar with PHP, JSP or ASP, this tag-based approach should already be familiar to you. 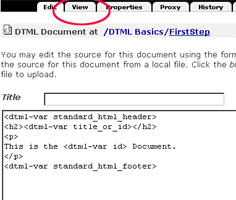 merely inserts the value of the DTML variable named "standard_html_header". This is one of the few predefined variables available in Zope, and, as the name suggests, it is used to display a common header for your site. fetch and display either the document's title or its ID. If no title is available (as is the case here, since I never specified one when I created the object), Zope will make do with the ID. inserts the value of another predefined Zope variable, "standard_html_footer". No prizes for guessing what this one's used for! 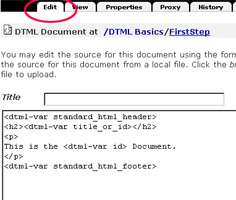 Zope will look for DTML tags within it and, finding none, will simply render the HTML as is. In addition to DTML Documents, Zope also includes a strange animal called a DTML Method. There are a number of fairly obvious similarities between a DTML Document and a DTML Method, together with some very subtle differences. It's the differences that can catch you out - which is why you should get to know them at this stage itself. and take a look at it in the Zope management interface, you'll notice the absence of a "Properties" tab on the top of the page (DTML Documents, on the other hand, have a very visible "Properties" tab). whereas the DTML Method displays the ID of its container - the parent folder (which I named "DTML Basics" a couple of pages ago). Consequently, DTML Documents are typically used to display static content, while DTML Methods are used to display dynamic content..
Hello. My name is <dtml-var myName>. This code belongs to a DTML Document with the ID "Introduction". The <dtml-var> tag is used to insert the contents of a DTML variable - which, over here, is called "myName". Why the barf? Because despite Zope's best efforts, it coldn't find a variable named "myName" anywhere - and so it had to generate the error above. You can make the error go away with one minor addition to the code above - add a default value for the variable via the "missing" attribute, and Zope will be happy. Hello. My name is <dtml-var myName missing="Neo">. Obviously, you can't define values for variables in this manner for very long - it tends to negate the point of having a variable in the first place. And so, Zope comes with something very cool - the ability to automatically inherit, or "acquire", variable from the Zope namespace. This capability to automatically search for and acquire variables is one of the most interesting things about Zope - and also one of the most common pitfalls for newbies. In order to obtain the value of a named variable, Zope will first look in the current folder, and then recursively iterate through the folders above the current folder until it finds the named variable. In the event that it doesn't, it will check a couple of other places (most notably the REQUEST namespace that is created when a form is submitted) and - if it still doesn't find the variable - die with the error message above. Pay attention to the footer there - you'll see that it contains a reference to a Zope variable named "ZopeAttributionButton". This variable actually references the Zope logo; this logo gets attached to the bottom of every page that uses this standard footer. What does this have to do with acquisition? When Zope finds a reference to "standard_dtml_footer", it searches through the folder hierarchy until it finds, or acquires, an object with that ID, and replaces the variable placeholder with the contents of that object. So, even though I've not defined those two variables in the folder containing the FirstStep object instance, Zope still possesses the intelligence to find them and use them within the DTML script. You can also format variable values with DTML's numerous formatting attributes. 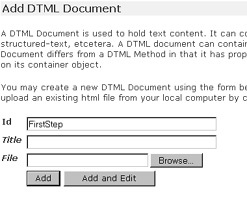 Consider the following DTML Document, which contains a simple HTML form. etc - displays a string following the variable. You can also format the display of the DTML variables using "structured text", which, according to http://www.Zope.org/Members/millejoh/structuredText, is "...text that uses indentation and simple symbology to indicate the structure of a document". Or, in other words, structured text is a set of predefined rules that Zope understands and can use to automatically format your document for you. As you can see, Zope uses its structured text rulesets to automatically hyperlink the text string to the email address specified. I'm not going to get into the details of structured text here - there are some great references out there, with my personal favourite being the one at http://www.zope.org/Members/redsea/Wiki/StructuredTextRules. Play with it, and you'll get the hang of it soon enough. In the meanwhile, I'm out of here. But fear not - your journey into the wild and wacky world that is DTML has just begun, and I will be back with more next week, complete with maps and lollipops. See you then! Note: All examples in this article have been tested on Linux/i586 with Zope 2.5.0. Examples are illustrative only, and are not meant for a production environment. 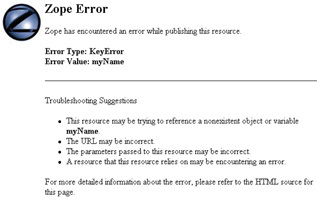 Melonfire provides no warranties or support for the source code described in this article. YMMV! This article was first published on 06 May 2002.